This gorgeous "Bouquet Alfresco" tapestry shows a large urn of flowers in the French countryside. This French tapestry shows a still life of flowers, with a large variety of blooms, set on a river bank, where potted plants, baskets of grapes and fruit, and a pillar with gold statuette decorates the scene. An elaborate border filled with floral and gold motifs, surrounds the scene beautifully. This piece shows the French floral style of the 17 century, where beauty of flowers is set in the most beautiful surrounds of an idyllic landscape. 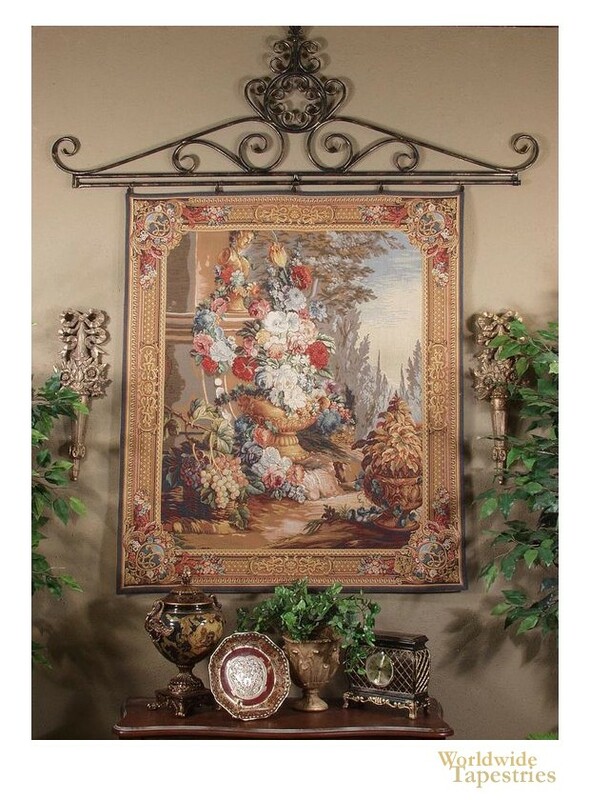 This French floral tapestry "Bouquet Alfresco" is backed with a lining and has a rod pocket for easy hanging. Note: tapestry rod and accessories, are not included in the price. Dimensions: W 57" x H 65"